No. 6 Michigan is in great shape if the past truly does not matter when it plays No. 24 Michigan State this weekend. 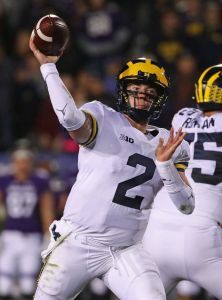 Shea Patterson has become an effective, dual-threat quarterback and he showed it in a 38-13-win over No. 15 Wisconsin . The defense ranks first in the nation against the pass and second overall. Since losing to then-No. 12 Notre Dame, Michigan has built momentum and gained confidence with six straight wins. The Wolverines, though, seem to face some intangible obstacles Saturday in Spartan Stadium. 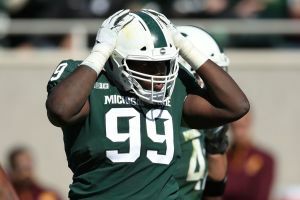 Michigan is 2-8 over the last decade against Michigan State and is 0-17 against ranked teams on the road since 2006. Coach Jim Harbaugh wasn’t around for many of those setbacks, but he is 1-2 against the Spartans and 0-3 against Ohio State, and his record in rivalries is something his players are well aware of this week. That was perhaps the strongest comment made by Harbaugh or his players Monday as they kicked off the rivalry week by toning down the talk. 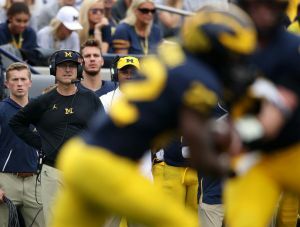 “We could all use a break from the clichés that have been plowed thoroughly on both sides,” Harbaugh said. 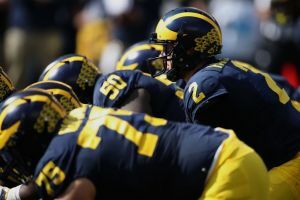 The fourth-year coach and former Michigan quarterback has plenty of memories — all good ones on the road and mostly bad ones at home — from the series. He just doesn’t want to share them publicly. Harbaugh has not lost a game in East Lansing, Michigan, as a player or a coach. 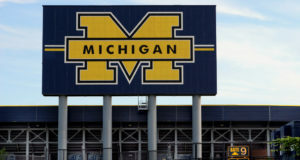 At the Big House, he left the 1984 loss against to the Spartans with a broken arm and is 0-2 against them on the sideline, infamously losing on a botched punt on the final play in 2015. Harbaugh was so clipped in his comments Monday it led to partial sentences. 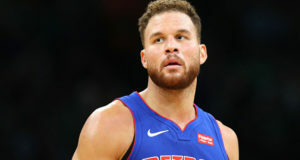 What will he tell his players about the chance to beat a rival, improving their place in the Big Ten race while ending a losing streak to ranked teams on the road? Michigan does appear to be set up to have a successful season, favored to beat Michigan State by about a touchdown to extend its streak. After a week off, the Wolverines will likely be expected to beat No. 18 Penn State at home. 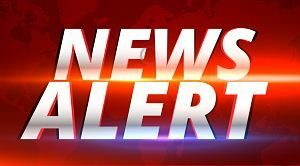 Rutgers and Indiana potentially provide late-season tuneups before the regular season finale at No. 2 Ohio State. Michigan players called the win over the Badgers a “statement game” and two days later they were still talking about what the program’s first win over a ranked team in two years has done for morale. “I feel like that’s going to carry us in a positive direction for the rest of the season and especially for this upcoming week,” linebacker Josh Ross said. All week, the Wolverines will be motivated to bring home the Paul Bunyan Trophy the victors get to keep. 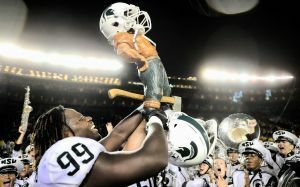 The Spartans took back the 4-foot high wooden statue last year after their 14-10 win and Michigan is missing it.